4 I saw thrones on which were seated those who had been given authority to judge. And I saw the souls of those who had been beheaded because of their testimony about Jesus and because of the word of God. They[a]had not worshiped the beast or its image and had not received its mark on their foreheads or their hands.They came to life and reigned with Christ a thousand years. 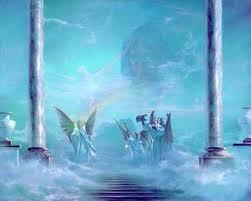 5 (The rest of the dead did not come to life until the thousand years were ended.) This is the first resurrection. 6 Blessed and holy are those who share in the first resurrection. The second death has no power over them, but they will be priests of God and of Christ and will reign with him for a thousand years. 11 Then I saw a great white throne and him who was seated on it. The earth and the heavens fled from his presence, and there was no place for them. 12 And I saw the dead, great and small, standing before the throne, and books were opened. Another book was opened, which is the book of life. The dead were judgedaccording to what they had done as recorded in the books. 13 The sea gave up the dead that were in it, and death and Hades gave up the dead that were in them, and each person was judged according to what they had done. 14 Then death and Hades were thrown into the lake of fire. The lake of fire is the second death.15 Anyone whose name was not found written in the book of life was thrown into the lake of fire. This entry was posted in Discipleship and tagged Christ, Christ Jesus, God, Gospel of Luke, Gospel of Matthew, Jerusalem, Jesus Christ, Matthew, New Testament, Old Testament, revelation, theology. Bookmark the permalink.